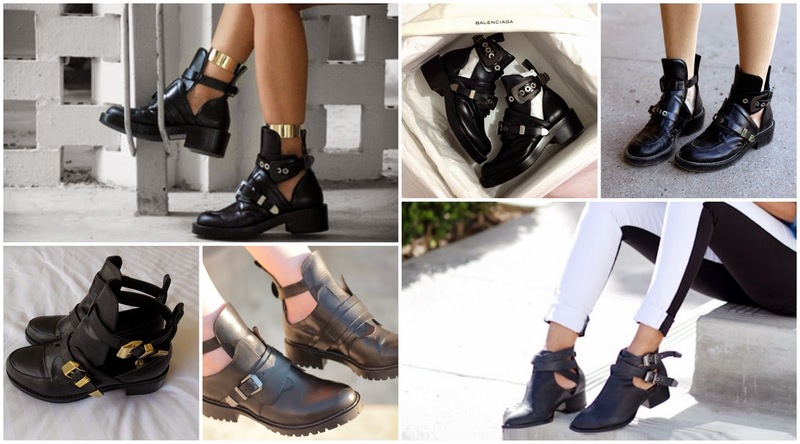 Cutout Boots || Favourite trends | RAWR BOWS. Whether it's winter or summer, black booties are always a must have in your wardrobe. Last year we started to see cutout boots in the stores. To be honest, at first I was like 'what the hell is that? why do they have holes?' but even though they might not be the warmest boots out there, they are pretty damn cool. What is great about cutouts boots is that, because they are not as warm as other boots, they can be worn all year around. In summer, they look great withe some distressed shorts or a LBD. When it gets colder you can wear them with black skinny jeans which is my favourite look and I'll be wearing it way too many times during this upcoming season. They also look super cute with ruffly socks even though it's not really my style. Price-wise, they tend to be a bit expensive. My personal favourites are the Balenciaga ones but as they cost around $1000 I cannot afford them. However, you can find similar ones at Topshop, Missguided, etc. I'm going to be investing in a pair when I go back to uni...they'll look cute with pastel, frilly ankle socks I think, or knee high socks, with a dress. Es una tendencia maravillosa, yo tengo unas, no me las quito!